Following is a step-by-step Windows 8 troubleshooting procedure. Note that this process doesn’t center completely on software because it’s often hard to tell at the beginning whether the problem at hand is caused by Windows 8 or by your PC’s hardware. 1Simply shut down Windows 8. Many folks often don’t have to move past this first step. Believe it or not, a simple shutdown solves a good 25 percent of the temporary glitches you might encounter, such as a frozen mouse or a locked-up PC resulting from a power failure. Shutting down works because it resets all your PC’s hardware — and Windows 8 itself — and returns everything to normal. By the way, if you can’t reach the Start screen or the Power button on the Settings charm because your PC is locked up tight or the mouse doesn’t move anymore, you have every right to get tough with your PC. First, try delivering the classic Windows Three Finger Salute by pressing the Ctrl+Alt+Del keys simultaneously, which displays a menu that includes commands for signing out and the Task Manager. Always check for hard drive errors after you’re forced to shut down Windows 8 by simply turning off your PC. For instructions on how to scan your drives for errors. 2If you restart your PC and the problem continues, double-check all cables leading to your PC. You might not have problems with your AC power cord, for example, but it’s quite easy to accidentally unplug other connectors from your PC — like your keyboard or network or external devices, such as your modem and printer. If you recently moved your PC or bumped against it, loose connections are prime suspects for all sorts of mischief. 3If all your cables are shipshape, your next mission is to sit — and think. Take a moment to consider any software or hardware you recently installed that might be causing (or contributing to) the problem. Always install new hardware or software one piece at a time because then you can easily tell which new addition is wreaking havoc. 4Shut down and remove any offending external devices — such as an external hard drive that’s dead in the water — to see whether your PC suddenly returns to normal. If so, that peripheral is your prime suspect, so try it on another PC to determine whether the device is still working. Also try using another cable. 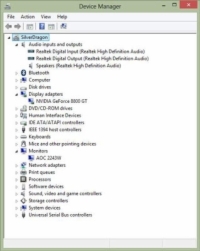 If the peripheral works fine on another PC, your problem lies in either the device driver or the device configuration that you set up in Windows 8. Check the manual for the device, reinstall the device driver (make sure to visit the manufacturer’s website for the latest driver first), and — if all else fails — contact the manufacturer’s technical support team. 5Uninstall any programs that are misbehaving or locking up Windows 8 and then reinstall them. After you reinstall — but before you apply a patch or an upgrade — try using the application to see whether it still exhibits the problem. Visit the developer’s website and check for information about compatibility, especially with Windows 8 and Service Pack patches, which often wreak havoc on unprepared software. 6If you recently made changes in the Control Panel, the System Properties dialog box, or any networking dialog boxes, take a moment to revisit those settings and verify that they’re still correct. Unfortunately, anyone can easily and accidentally change a setting within one of the Control Panel screens. To make sure that you don’t disturb something, just click Cancel if everything looks okay. 7If you’re still having problems, check your hard drives. Verify that your drives are free from disk errors. 8Scan your hard drives and any removable disks. On your Windows 8 machine, use a product like avast! 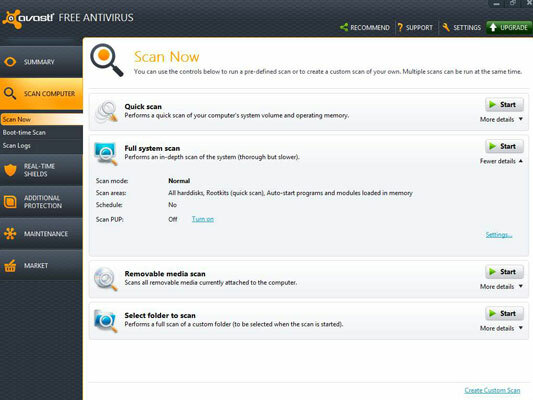 Antivirus Home Edition, from AVAST Software. 9Verify that you’re still connected to and receiving packets from your home or office network — or, if you’re using a broadband connection, your cable modem or digital subscriber line (DSL). If your network is down, Windows 8 has a nasty habit of slowing to a crawl when you open files or use Windows Explorer — and many applications that expect a network connection as their divine right can lock up tighter than Fort Knox. 10If you’re using a shareware or freeware screen saver, realize that a slew of badly written screen savers, readily available for download on the Internet, can take Windows 8 on a permanent vacation. Right-click your Desktop, choose Personalize, and then click the Screen Saver link. Choose None and then click OK.
Reboot and use your PC for a day without any screen saver — or choose one of the Windows 8 screen savers provided by Microsoft, which are proved stable. 11Check whether another user with Administrator access might have changed the write-protect status of your applications or your documents. This step is for those who share a PC with other users by taking advantage of the multiuser features built in to Windows 8. 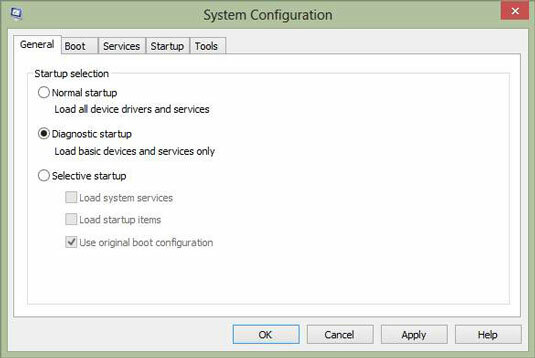 12Even if you can boot in Safe mode, first try the Windows 8 System Configuration utility, which can help you diagnose where the trouble lies in your boot process. To disable just one startup program, click the Startup tab and click the Open Task Manager link, which displays the Task Manager’s Startup pane. Right-click the offending application and choose Disable. Then it’s a breeze to troubleshoot problems you encounter when installing new software that loads automatically during the boot process. 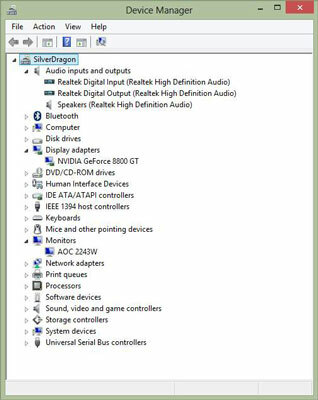 Make sure that Windows 8 hasn’t flagged any of your hardware devices as either disabled or not working; if a component is flagged with an exclamation point, a little investigation might well turn up the solution to the problem. At this point, you’ve exhausted most of the easier troubleshooting chores and fixes you can perform. It’s time to get drastic.